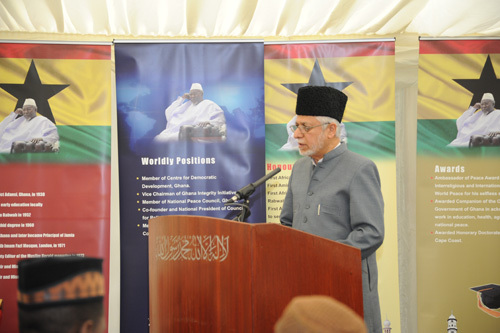 The Pan-African Ahmaidyya Muslim Association (PAAMA) UK held a special Maulana Abdul Wahab Commemorative Event at Masjid Fazl on 7th September 2014. The programme started with Tilawat by Basit Binsu Sahib and English translation by Subur Tahir Sahib. This was followed by Urdu poem written by Maulana Ataul Mujeeb Rashed Sahib about the late Maulana Abdul Wahab Adam Sahib entitled “Resplendent Jewel” which was recited by Salman Shah Sahib with its English translation presented by Zafar Bhunnoo Sahib. 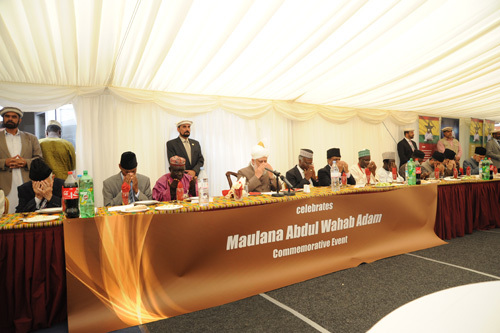 After a Welcome Address by PAAMA President, Tommy Kallon Sahib, Maulana Ataul Mujeeb Rashed Sahib, Imam of the London Mosque highlighted the many services rendered by Maulana Abdul Wahab Adam Sahib in Pakistan and the UK. This was followed by a very insightful and candid account of the Family Life of Maulana Abdul Wahab Adam Sahib delivered by his son, Hassan Wahab Sahib. 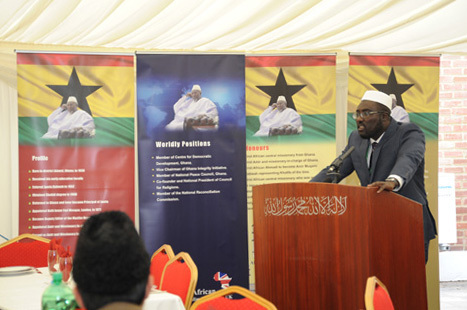 Maulana Muhammad bin Salih, Acting Amir and Missionary In-charge Ghana, then shared an inspiring recollection on the remarkable services rendered by Maulana Abdul Wahab Adam Sahib in Ghana. The Concluding Address was delivered by Rafiq Ahmad Hayat Sahib, Amir UK, who chaired the formal session. Following Zuhr and Asr prayers, Huzur Aqdas (ata) graced the occasion with his august presence for lunch. 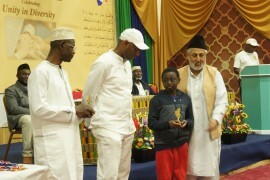 As part of the Maulana Abdul Wahab Adam Commemorative Event, the Pan-African Association, with the blessed approval of Hadhrat Ameerul Mumineen, launched a new merit award called “The Abdul Wahab Adam Award”. 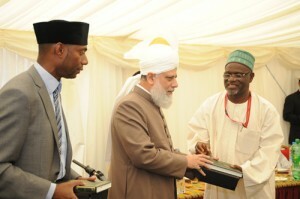 As directed by Huzur Aqdas this award recognises missionaries of African origin who have served the Jama’at with distinction and credit. ~ Maulana Muhammad Bin Salih Sahib who trained as a missionary at Jamia Ahmadiyya Pakistan and has served the Jama’at in Ghana in various capacities as a missionary and Naib Amir. He also served as the first Missionary who opened the Zimbabwean mission. He is the currently serving as the Acting Amir and Missionary In-charge of Ghana. ~ Maulana Azhar Haneef Sahib who also trained as a missionary at Jamia Ahmadiyya Pakistan and has served the Jama’at in the USA in various capacities including Missionary. He is the currently serving as Naib Amir USA. 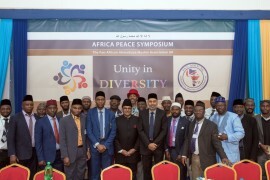 ~ Maulana Ibrahim bin Yakub Sahib, also trained as a missionary at Jamia Ahmadiyya Pakistan and has served in various capacities as a missionary of the Ahmadiyya Muslim Community. He is currently serving as the Amir and Missionary In-charge Trinidad and Tobago. ~ Maulana Bakri Abedi Kaluta Sahib who also trained as a missionary at Jamia Ahmadiyya Pakistan and has served in various capacities including Regional Missionary and Principal of Jamia Ahmadiyya in Tanzania. He is currently the In-charge of Swahili Desk, Tanzania. ~ Maulana Abdul Ghaffar Sahib who also trained as a missionary at Jamia Ahmadiyya Pakistan and has served the Jama’at in Ghana, Tuvalu and the United Kingdom in various capacities including Imam of the Baitul Futuh Mosque in London as a missionary. 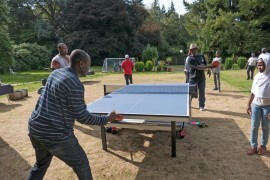 He is currently serving as a Regional Missionary in the United Kingdom. After the presentation of the awards by Huzur Adqas (ata), he led all in silent prayers before lunch was served. May Allah bless these humble endeavours and grant all recipients of the Abdul Wahab Adam Award further success in serving the Jama’at in future. Ameen. Please click here to view a video summary of this event.